By the summer of 1944, the Allies were on a roll. On June 6, the vanguard of a million-man offensive that began as Operation Overlord was spreading eastward across France, crushing all German attempts to stop it. On August 15, Operation Overlord had been complemented by Operation Avalanche—the U.S. Seventh Army’s invasion of southern France. The first few weeks following the landings had gone relatively smoothly, with American and Free French divisions chasing General Friedrich Wiese’s disorganized Nineteenth Army up the Rhone River valley; at only a few, well-chosen places did the Germans make a stand and offer serious resistance. In September 1944, as the Allied drive neared the French-German border in Alsace-Lorraine, German opposition became more determined. The Germans, after all, were fighting with their backs against their border and were doing everything in their power to keep the enemy out. By October, though, the fighting in the hilly, heavily forested region had settled into a war of attrition that, little by little, the Allies were winning. By November, American units of Maj. Gen. Wade Haislip’s XV Corps had pushed all the way to French-German border between Saarbrucken and Wissembourg, while the French First Army forced the Belfort Gap, destroyed German forces in the southern Vosges Mountains, and reached the Rhine north of Switzerland between Mulhouse and Basel. Simultaneously, the French 2nd Armored Division, spearheading the Seventh Army advance, forced the Saverne Gap in the northern Vosges and liberated Strasbourg on November 23. The effect of these two advances was to force German units in southern Alsace west of the Rhine into a semi-circular bulge around the city of Colmar––a bulge that became known as the Colmar Pocket. The rout of the German armies in the west seemed to be imminent. In late 1944, with American, British, Canadian, Free French, and Polish forces lined up along Germany’s border with Holland, Belgium, Luxembourg, and France and ready to plunge into the heart of the Third Reich, it seemed that the predictions that the war was nearly over were about to come true. Germany is beaten, the optimists opined. She’s on her last legs, others said. Her defeat is inevitable, and sooner rather than later. Such an outcome certainly seemed within the realm of possibility. Tens of thousands of Wehrmacht and SS troops in France were either dead or in POW camps. Paris and Brussels had fallen to the Allies, and one city, town, and hamlet after another had been liberated. On the Eastern Front, the news was just as good, with a resurgent Soviet Army decimating German ranks in a massive new offensive called Operation Bagration. The German armaments industry, too, had been demolished by incessant Allied air raids, and the production of tanks, guns, ammunition, and aircraft was reduced to a trickle of what it had been earlier in the war. Morale on the German home front was low and sinking lower; even Adolf Hitler’s own officers had attempted to kill him at his eastern headquarters in East Prussia in July. There was no way, Allied planners confidently boasted, that Germany could sustain its war effort much longer. Just as the Allies were about to put the champagne on ice in anticipation of their victory celebration, however, the Germans would do the unexpected and the impossible: they would launch not one but two counteroffensives aimed at halting the Allied advance in the West. Although snow fell lightly, giving a peaceful, Christmas-card ambiance to the hills, trees, and mountains, the Alsace front was anything but quiet. In early December, Maj. Gen. Withers A. Burress’ 100th Infantry Division went on the offensive in the vicinity of Bitche, France. After fierce fighting from December 6–10, the division occupied the nearby towns of Mouterhouse, Wingen-sur-Moder, and Lemberg. Men of the 398th Regiment, 100th Infantry Division pass through a demolished roadblock in Alsace, November 1944. Although it initially gave ground, the “Century” Division’s 399th Infantry Regiment tenaciously defended Lemberg in the face of a determined counter-attack by the entire 559th Volksgrenadier Division and parts of the 257th; in Rimling, on the 399th’s left flank, the 397th Infantry also refused to relinquish its prize and stopped attack after attack by the vaunted 17th SS Panzergrenadiers—the “Götz von Berlichingen” Division. (The 3rd Battalion of the 399th Infantry Regiment earned a Presidential Unit Citation for its battle at Lemberg). The division then advanced to Reyersweiler, which fell after four days of fighting—December 11–13. Although the confident Germans had expected to surround and annihilate the 100th in two days, the division’s stubborn defense disrupted the Germans’ efforts to regain the Saverne Pass. In recognition of their extraordinary efforts, the 3rd Battalion, 397th Infantry Regiment (plus Company H, 397th) also was awarded the Presidential Unit Citation for their defense of Rimling. For four days, elements of the 398th Infantry Regiment of the 100th Division then assaulted Fort Schiesseck, a major Maginot Line defensive work––a 14-story-deep fortress, complete with disappearing gun turrets and 12-foot-thick, steel-reinforced concrete walls. The fort’s German defenders would hold out until December 20. Thanks to their hearty offense and stout defense, the men of the 100th would later become known as the “Sons of Bitche.” The fierceness of the combat was a precursor of things to come. Hitler had plans for Alsace-Lorraine. On December 10, 1944, Hitler appointed Interior Minister and SS Chief Heinrich Himmler, who had no military experience, commander of the newly created Oberkommando Oberrhein (Upper Rhine High Command), whose mission it was to defend the upper Rhine, and whose creation essentially stripped Generaloberst Johannes Blaskowitz’s Army Group G of responsibility for the defense of the Colmar area and of the Rhine River south of the Bienwald. The designation of the command as a “High Command” also meant that the Oberkommando Oberrhein was an independent, theater-level command that answered directly to Hitler and OKW, rather than to OB West, the command responsible for the Western Front. On December 11, 1944, Hitler summoned a number of high-ranking generals to his top-secret underground headquarters known as the Adlerhorst in Bad Nauheim, a resort city 20 miles north of Frankfurt-am-Main, to let them in on his strategy to halt Germany’s slide toward defeat. He told the generals that they were to immediately draw up operational plans to smash through the Allies, massing on Germany’s western border. Whereas the Allies would later call the first of the two operations the “Battle of the Bulge,” Hitler called it Unternehmen Wacht-am-Rhein (Operation Watch on the Rhine), after a well-known German song. It was not the Rhine River that Hitler planned to secure, however, but rather the port of Antwerp, Belgium, less than 100 miles west of the front at Aachen. Antwerp had become the Allies’ major port through which millions of tons of food, ammunition, fuel, weapons, clothing, and other vital supplies were pouring and Hitler badly needed to put it out of commission. Antwerp was also the terminus of the dividing line between the Allies’ two great western armies: Field Marshall Sir Bernard Law Montgomery’s 21st Army Group and General Omar N. Bradley’s 12th Army Group. If his troops could split the two forces along this seam, inflict massive casualties, and capture Antwerp, Hitler was convinced that the war-weary American and British public would rise up and demand that their leaders enter into a negotiated settlement with Germany. In his own warped world view, Hitler believed that Britain and America would then join forces with Germany to fight against what he supposed was their common enemy: the Soviet Union. Hitler saw the ideal place for his counter-offensive: the same hilly, heavily treed, “impassible” Ardennes-Eifel region through which his armies had plunged in 1940 to invade Belgium, Holland, France, and Luxembourg. The generals were aghast. There was no way such a counteroffensive could succeed, they protested. It was all they could do to keep from being overrun by the Allies, hammering at them from all sides. Such an operation, they cried, could only lead to disaster. Hitler would not be moved. Brushing aside his generals’ concerns, Germany’s supreme warlord told them to find a way to do it. Wearing camouflage smocks, German infantry moves through the icy fog of a January morning in preparation for another counterattack. And do it they did. Pulling together almost every unit and piece of equipment in the area: three armies with 18 infantry and seven panzer divisions, totaling nearly 300,000 men, 2,600 artillery pieces and rocket launchers, more than 1,000 tanks and self-propelled guns, and a handful of aircraft. They would slam into the 80,000 Americans—many of whom were recently arrived and had never before seen battle—stretched across a front of 75 miles between Monschau, Germany, and Luxembourg City. To protect his southern flank once Wacht-am-Rhein was launched, Hitler had devised a secondary counteroffensive—“Unternehmen Nordwind” (Operation North Wind)—this one directed at stopping Lt. Gen. Jacob Devers’s 6th Army Group (consisting of Maj. Gen. Alexander Patch’s U.S. Seventh Army and French General Jean de Lattre de Tassigny’s French First Army) that had landed along the Riviera in August and was now firmly lodged in Alsace-Lorraine, from crossing the border into Germany. Wacht-am-Rhein began with terrific, terrifying violence at dawn on December 16 as barrage after barrage saturated American positions and wave after wave of German infantry, supported by panzers, tore into the shocked Yanks, freezing in their snow-filled foxholes. For a week, the Germans scored one victory after another and, with the Belgian city of Bastogne surrounded, seemed on the verge of fulfilling Hitler’s orders of thrusting all the way to Antwerp. It was, as historian Charles B. MacDonald put it, “the greatest pitched battle ever fought by American arms,” with some 600,000 GIs engaged during its course. On December 18, SHAEF ordered Seventh Army to release the 80th Infantry and 4th Armored Divisions from Patton’s Third Army and dispatch them immediately for the Ardennes front; Patch repositioned the 12th Armored Division to fill in the gap left by their departure. The following day, General Dwight D. Eisenhower, the Supreme Allied Commander, called a meeting of his top-level commanders (Bradley, Devers, and Patton, among others) at Verdun, where they discussed the German thrust into the Ardennes and what to do about it. At this conference, Ike told Devers to halt all offensive operations and even be prepared to pull back from some of the hard-won ground—a directive that did not sit well with the 6th Army Group commander. The reversion to a defensive role also cancelled Devers’s plans for reducing the Colmar Pocket, the German bridgehead that stretched 50 miles along the Rhine’s western banks south of Strasbourg. Ike had a new worry: In addition to the German assault in the Ardennes, Allied intelligence had indicated that the enemy was building up additional forces to launch a secondary offensive in the Alsace region. Eisenhower wanted Devers to meet it by withdrawing and shortening his lines to create reserves—a move that would essentially give back northern Alsace, including the city of Strasbourg, to the Germans. Devers, Patch, and de Lattre strenuously objected. In the end, rather than withdraw, Devers agreed to shift his forces to create a mobile reserve that could block the enemy’s key avenues of approach leading into his front. But Eisenhower was right to worry. The Operation Nordwind plan called for Lt. Gen. Hans von Obstfelder’s German First Army to attack southward from the West Wall and into France, through Bitche, the Saverne Gap, and the Wissembourg Gap (the latter the site of first German success in the Franco-Prussian War of 1870) between the Low and High Vosges Mountains of Alsace-Lorraine, and link up with another thrust northward by Nineteenth Army, locked in a pocket around Colmar. The two armies, it was envisioned, would meet east of the Saverne Gap, recapture the city of Strasbourg, and trap the U.S. Seventh Army in northern Alsace. Although Allied intelligence had completely missed the Germans’ Wacht-am-Rhein build-up in the Ardennes-Eifel region, such was not the case in Alsace-Lorraine. Eisenhower correctly surmised from G-2 reports that the enemy was preparing to launch an attack against Devers’s forces and plans were made to counter this assault. But knowing that an enemy is about to attack and being able to stop that attack are two different things. German counterattacks in Belgium and northeast France pushed temporary bulges into Allied lines. Even as Wacht-am-Rhein’s momentum was fading, south of Frankfurt-am-Main, in the Pfalz, or Palatinate, region of Germany, the Germans were building up for their second thrust. Allied intelligence would eventually identify elements of nine divisions of the First German Army facing Seventh Army. Northeast of Sarreguemines was General Max Simon’s XIII Corps (commanding the 17th SS Panzergrenadier and 36th Volksgrenadier Divisions, backed by several artillery units). To the east, above Bitche, was Lt. Gen. Erich Petersen’s XC Corps and the 257th and 559th Volksgrenadier Division. Next to XC Corps was Lt. Gen. Gustav Höhne’s LXXXIX Corps and the 256th and 361st Volksgrenadier Divisions, all beefed up with numerous artillery units. At the angle where the German-French border makes its abrupt southward turn was Lt. Gen. Karl Decker’s XXXIX Panzer Corps, with its 21st Panzer and 25th Panzergrenadier Divisions, augmented by a company of super-heavy 70-ton Jagdtiger anti-tank mobile weapons. At Colmar, Generalleutnant Siegfried Rasp (he had just replaced Wiese) had his Nineteenth Army standing by. 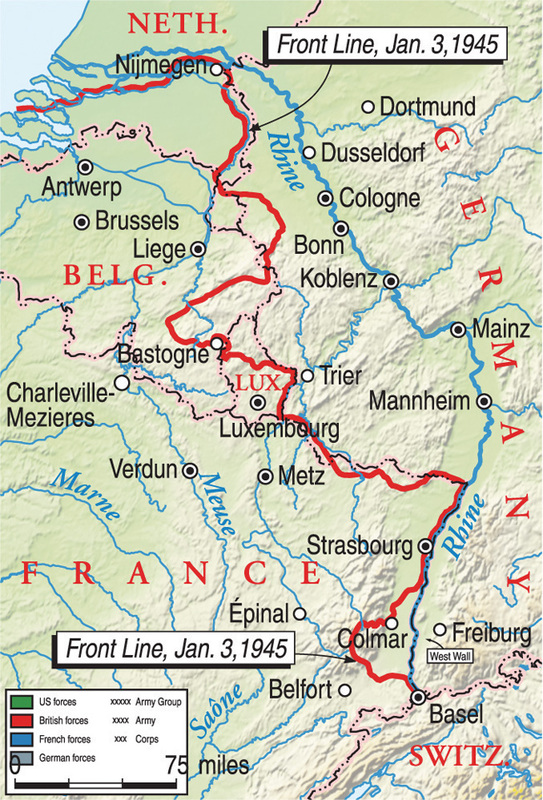 Additional enemy forces farther to the east across the Rhine were units under XIV SS Corps control and believed to be equivalent in strength to eight battalions. Other units, including the 7th Parachute Division, were kept in First Army reserve. The total German infantry strength facing Seventh Army was estimated to equal some 24 or 25 battalions of American infantry; the exact size of the armored forces was a question mark, but was no doubt considerable. Operation Nordwind was scheduled to begin on New Year’s Eve. Once it was successful, a follow-up thrust—Unternehmen Zahnarzt—(Operation Dentist), a major attack against the rear of Patton’s Third Army—would take place. Up until about Christmas Day, the Allies believed that elements of various panzer and panzergrenadier divisions, which had been identified on the Seventh Army front at various times during December, might have been withdrawn and sent north to join the Ardennes battle. It even seemed possible that the First German Army, opposing Seventh Army, might be deprived of all its mobile units. Those estimations would prove wildly inaccurate. The plan for Nordwind was to kick off on New Year’s Eve with the XIII SS Corps on the westernmost flank, striking south toward Singling while four (later five, with the addition of the 6th Mountain SS Division) divisions from XC and LXXXIX Corps swiftly crossed into France. To the south, west of the Rhine, the Nineteenth Army was ordered to break out of the Colmar Pocket, drive north, and strike the eastern flank of the Americans north of Strasbourg. One of the Germans’ major objectives was taking the Saverne Gap, 20 miles northwest of Strasbourg; it is a narrow, gorge-like passage less than 100 yards wide in places that cuts through the Vosges from Arzviller to Saverne. Adding to the difficulty of fighting in this area was a string of Maginot Line forts that the Germans had captured earlier in the war. Patch directed Haislip’s XV Corps––made up of the U.S. 44th, 100th, and 103rd Infantry Divisions—to cover 35 miles of front to the west of the Vosges Mountains; Maj. Gen. Ted Brooks’s VI Corps—consisting of the 36th, 45th and 79th Infantry, and 14th Armored Divisions­­—would man the front to the east in the exposed Lauterbourg salient. The infantry regiments of three other recently arrived divisions—the 42nd, 63rd, and 70th—were rushed up from the south—sans artillery and support units—and turned into “task forces” to plug the numerous gaps and weak points in the Seventh Army’s lines. The 42nd was designated “Task Force Linden,” the 63rd became “Task Force Harris,” and the 70th was known as “Task Force Herren.” The U.S. 12th Armored Division would be held in reserve. 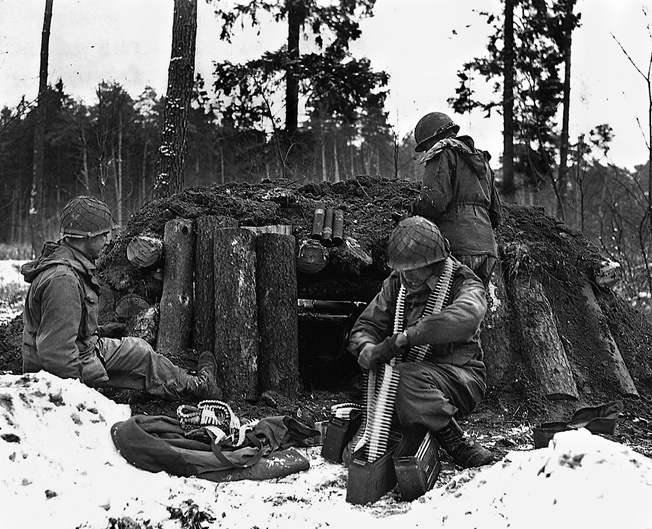 Soldiers of Task Force Linden (Company I, 242nd Regiment, 42nd Infantry Division) prepare for action at their log-and-dirt bunker near Kauffenheim, France, January 8, 1945. Between Saareguemines and Wissem, then, the Americans had nine infantry and elements of two armored divisions in place and on the alert by the end of December. 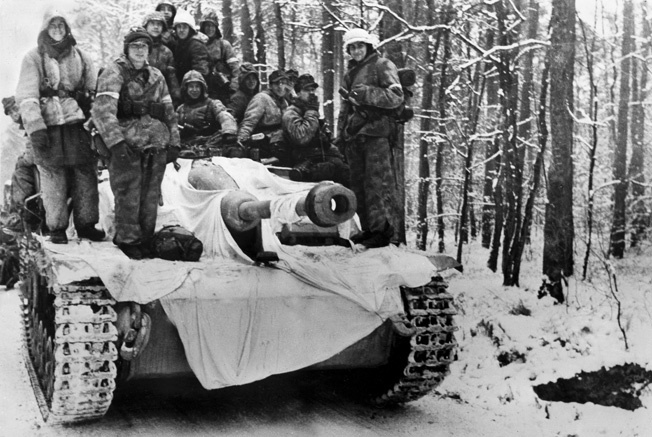 On December 29 the Americans learned that the 10th SS Panzer, 21st Panzer, and 25th Panzer Divisions, along with the 17th SS Panzergrenadier Division—were still in the area, refitting in preparation for action. Another battle-hardened outfit, the 25th Panzergrenadier Division, was refitting at nearby Zweibrücken, Germany. Furthermore, rail movements, reports from captured enemy soldiers, and aerial reconnaissance all confirmed a major build-up of forces in the Saarbrücken area, as well as in the Colmar Pocket and east of the Rhine Valley. Far from being on its last legs, the Third Reich seemed to have an unlimited supply of troops, ammunition, and equipment in reserve ready to throw at the Allies. Late in the day of December 31, the left side of the American line near Sarreguemines suddenly trembled as the Germans opened fire with a well-placed barrage of artillery rounds, followed by a charge of 2,000 men of the 17th SS Panzergrenadier Division heading straight for the 397th Regiment of the 100th Infantry Division. The next day, the four infantry divisions of XC and LXXXIX Corps (the 256th, 257th, 361st, and 559th Volksgrenadier Divisions), advancing quietly through the Low Vosges without a preliminary artillery preparation, and with their movements masked by fog and thick forests, infiltrated near Bitche the only unit standing in their way—Task Force Hudelson (94th and 117th Cavalry Squadrons, 62nd Armored Infantry Battalion, and a company of tank destroyers)—and managed to penetrate 10 miles into the seam between the 44th and 100th Divisions. That move shoved TF Hudelson aside, hit Maj. Gen. Robert T. Frederick’s 45th Infantry Division, and drove a wedge between Patch’s two corps, the XV and VI. This assault was followed the next day by the experienced and well-equipped 6th SS Mountain Division, which thrust farther south and captured the town of Wingen-sur-Moder in the west of the low Vosges Mountains. Operation Nordwind in Alsace-Lorraine caused weeks of confusion and casualties, but ultimately failed to halt the Allied drive into Germany. In an effort to contain the penetration, Patch released the 12th Armored Division’s Combat Command B to VI Corps. But the 12th Armored was relatively green and no one knew if they could do much to stop the enemy avalanche barreling through the mountains. With bullets flying and shells screaming overhead, the stunned American troops reeled from the blow and began falling back until some order could be restored to their lines. This was the opening gambit for a series of moves that, over the next three weeks, would severely test the mettle of Seventh Army throughout Alsace-Lorraine. As the Germans began their Alsace offensive, Eisenhower again gave serious thought to moving 6th Army Group back (thus losing all the ground that had been gained during the fall) and abandoning Strasbourg. The French government and French commanders vehemently objected to this idea and Ike had to deal with the intrusion of politics into the conduct of war: “The French continued to worry about the safety of Strasbourg,” he wrote. “On January 3, [General Charles] De Gaulle [the contentious leader of the Free French Forces] came to see me. I explained the situation to him and he agreed that my plan to save troops in that region was militarily correct. However, he pointed out that ever since the [Franco-Prussian] war of 1870 Strasbourg had been a symbol to the French people; he believed that even its temporary loss might result in complete national discouragement and possibly in open revolt. As events would prove, it was not Strasbourg that the Germans wanted to capture but rather the entire Alsace-Lorraine region. The situation for Maj. Gen. Ira T. Wyche’s 79th Infantry Division was typical for many American units in Alsace-Lorraine in late 1944. No stranger to combat, the 79th had come ashore at Normandy on June 14 and took part in the heavy fighting and capture of the fortified port of Cherbourg, then battled its way as a part of Third Army across France and into Alsace-Lorraine, pausing briefly north of Strasbourg. 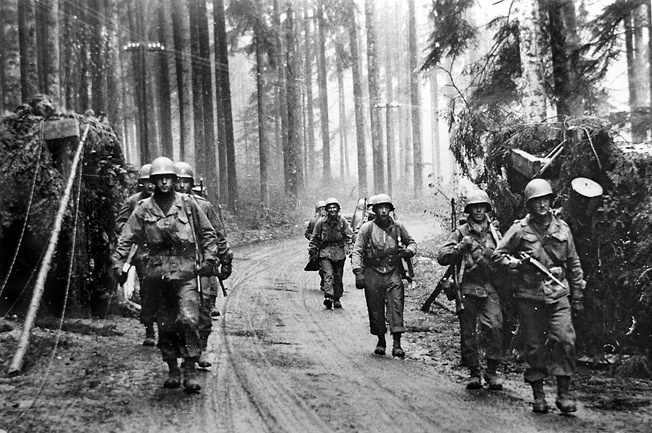 Worn out by weeks of combat, more hard fighting loomed ahead for the 79th; it was required to split itself, with the division’s 315th Regiment holding the Maginot Line fortresses north of the Haguenau Forest at Rittershoffen and Hatten, and the 314th Regiment south of the forest in the vicinity of the French villages of Rohrwiller, Bischwiller, Zinswiller, and Drusenheim, just west of the Rhine and north of Herrlisheim. (The 313th Regiment was temporarily attached to the 45th Division.) The 79th would be spared none of the enemy’s fury. An American tank destroyer of Alexander Patch’s Seventh U.S. Army fires on German positions in a factory at Kaltenhouse, a suburb of Haguenau. The Germans, too, were on the move. On January 5, XIV SS Corps, east of Strasbourg, crossed the Rhine and pushed units into the Gambsheim area, evidently seeking a fight with the 79th. At Herrlisheim, the 314th was hit by saturating mortar and artillery barrages that began on the frigid night of January 6-7 and would go on for days, a week, two weeks, then three. Men cracked under the unrelenting strain of the steel hail, but the line held. The 314th’s sister regiment, the 315th, also had its hands full. Colonel Hans von Luck’s 125th Regiment of the 21st Panzer Division was sent into the fight by XXXIX Panzer Corps and on January 7 was approaching one of the forts in which the 315th, augmented by elements of the 14th Armored Division and Task Force Linden, had taken position. Von Luck said, “Suddenly, we could make out the first bunker, which received us with heavy fire. Our leading men and the accompanying SPV landed in thick minefields; the artillery stepped up its barrage of fire.” Battling in the foot-deep snow against the holed-up Americans, von Luck’s men managed to capture one of the bunkers, knock out a few Shermans, and take a number of prisoners before heavy artillery fire forced a pullback. But the Germans weren’t about to give up. The 21st Panzer Division was reinforced by the 25th Panzergrenadier Division and 20 self-propelled assault guns. Somehow, however, the Germans pulled it off and the Yanks in the first bunker were captured without a fight. Nearby positions soon realized what was happening and the night was illuminated with explosions and munitions of all calibers saturating the air. Panzergrenadiers rushed into Hatten and the ferocious battle for that village and nearby Rittershoffen went on for days. Von Luck called the encounters “one of the hardest and most costly battles that had ever raged on the western front”—battles that would continue for the next two weeks. Repeated attempts by the Americans to launch counterattacks to free the two trapped battalions of the 315th were unsuccessful. The fighting in Rittershoffen would not end until January 21, when Seventh Army ordered the surviving troops to withdraw by fighting their way out. Wordlessly, many of the townsfolk and von Luck’s men, drawn by the chords, gathered and listened. Many had tears in their eyes. While the battles for Rittershoffen and Hatten were still going on, farther to the south a task force from the 79th was sent to clear the enemy out of the Steinwald, a small patch of woods north of Gambsheim. This operation did not go well because, at that very moment, the Germans were bringing in fresh formations from east of the Rhine. A couple of kilometers north of the Steinwald, elements of the 79th’s 314th Infantry had better luck. After securing Rohrwiller, the Yanks were ordered to proceed on to Herrlisheim but then received word that Company A, 232nd Infantry (TF Linden, 42nd Division), was in trouble in Drusenheim, and 2nd Battalion, 314th, was to come to A/232nd’s aid en route to Herrlisheim. Easier said than done. 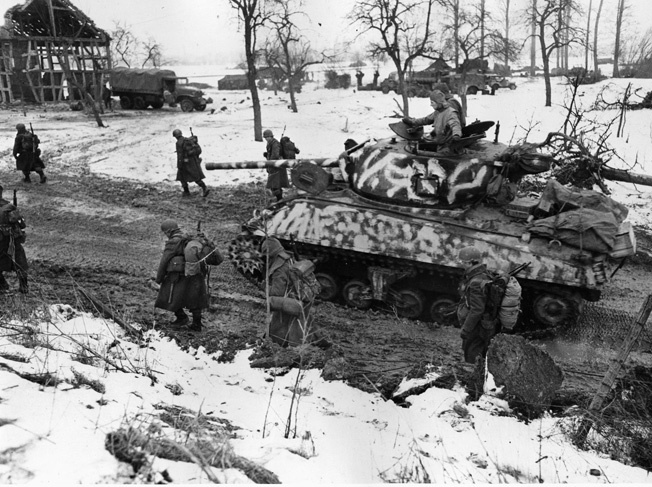 At 2:00 pm on January 6, Company G, 314th, entered the northwest side of Drusenheim riding on tanks. After making contact with A/232nd, 2nd Battalion crossed the Moder River bridge under small-arms fire to clear and secure the southern part of town. Five tanks managed to cross the bridge before it partially collapsed and became unusable. The five tanks then accompanied Company F, which was on point, for the attack. At 4:30 pm, as Company F reached the outskirts of Drusenheim, it met light artillery fire. The Yanks attacked the enemy’s strong point—a factory building on the east bank of the Moder, where it captured two officers and 51 enlisted men. The rest of the 2nd Battalion took up positions in or around Drusenheim to await the inevitable German counterattack. 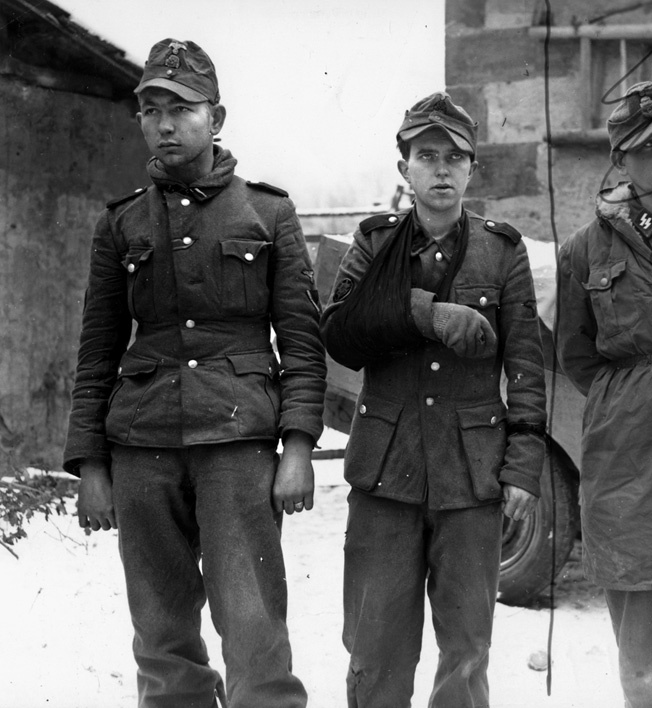 Young German prisoners captured by the Seventh Army. As the 314th’s 3rd Battalion moved up to take over the positions back in Rohrwiller that had been evacuated by 2nd Battalion, it came under the heaviest artillery barrage it had received to date. Meanwhile, during the night of January 6-7, the bridge at Drusenheim was repaired while under constant enemy fire. The 2nd Battalion in Drusenheim was hit with heavy artillery at dawn on January 7, and the barrage continued for an hour. Enemy infantry, estimated at a battalion, with tank support, struck Company F’s position in the factory. The Germans were using the high embankment of the Drusenheim-Herrlisheim highway for cover, and when they showed themselves, Company F and its attached tanks from 12th Armored’s Combat Command B fought back. After a quick exchange of fire, the enemy broke contact and moved its attack northeast against Company G’s position. Company F at the factory, along with Company E sheltering in the eastern part of the Bois de Drusenheim, were ordered to advance into Drusenheim to assist Company G.
Company E arrived at Company G’s position without a problem, but when Company F tried to execute its move, it fell under heavy fire from artillery positions on the highway embankment and was sent wading back across the icy Moder to Company E’s old position. As night approached, and suspecting an armor attack from the Germans, Company G was pulled back across the bridge to man the perimeter along the southwest edge of Drusenheim. Company F, shivering in their soaked, ice-covered uniforms, manned the eastern edge of the Bois de Drusenheim and an outpost in the northwest section of town, while Company E remained on the southern tip of Drusenheim. These positions rarely would change for the next 12 days. Staff Sergeant Howard C. Pride, a communications wireman with Headquarters Company, 2nd Battalion, 314th, recalled his battalion’s time in Drusenheim. “We moved in and our GIs were fighting and defending this town from windows and houses. The Germans were just across the [Rhine] river and they kept our outfit active. Not continuous fighting but sporadic––enough so that if you stuck your nose out, you’re gonna get shot at. They shelled us quite often from where, I don’t know. But I know that we were there too long, probably. “We used to take trips back in our jeep [to and from Rohrwiller] and as we came into the town, the Germans would shell us with artillery. We were probably playing games with them because we knew the shells were coming when we’d come down that road, so we opened that jeep up and we’re going 50-60 miles an hour into our town and they no longer saw us. The entire Alsace-Lorraine region began to resemble a giant chessboard, with the various commanders moving whole divisions around as if they were pawns, knights, and bishops. On January 7, XXXIX Panzer Corps transferred the 21st Panzer and 25th Panzergrenadier Divisions from the west of Bitche to the Lauterbourg area in the extreme northeast corner of Alsace-Lorraine in preparation for a major push through the Haguenau Forest. Devers and Patch were also moving elements around. From the quiet, far-western end of the line, the 36th and 103rd Infantry Divisions, along with the 12th and 14th Armored Divisions, were sent to Brooks’s VI Corps, whose units were taking the brunt of the German assault. Mounted German infantry, some with white helmets, ride into battle atop a Sturmgeschutz covered with white sheets to blend with the snow. Note the heavily treed terrain, typical of the Haguenau Forest. On January 8, Combat Command B of the 12th Armored Division (consisting of the 56th Armored Infantry Battalion and the 714th Tank Battalion) was ordered to assist the 79th Infantry Division in its attack on the German stronghold at Herrlisheim but made little progress, the Shermans proving no match for the lethal German antitank defenses. On that same day, January 8, farther to the west, the 6th SS Mountain Division captured Wingen-sur-Moder, between the XV and VI Corps. An M-4 Sherman tank of the 781st Tank Battalion stands guard at Wingen-sur-Moder, France. The wrecked jeep, GI helmet, and burning truck in the background attest to the ferocity of the fighting in Alsace. Unfortunately, the owner of the house had boarded up the doors and windows and the two GIs found themselves inside with no avenue of escape. At about the same time that Daub and Hunter were being taken prisoner, Technical Sergeant Charles F. Carey of the 397th was also battling for his life at Rimling. On January 8, Carey was in command of an antitank platoon when about 200 enemy infantrymen, accompanied by a dozen panzers, attacked his battalion and overran part of its position. After his guns were knocked out, Carey took it upon himself to organize a patrol and rescue two of his squads that were about to be surrounded, evacuating those who had been wounded. 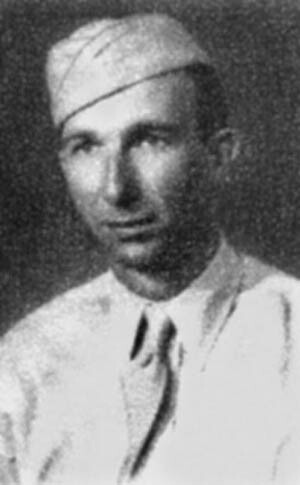 Technical Sergeant Charles F. Carey, posthumous recipient of the Medal of Honor. He then organized a second patrol and attacked an enemy-held house from which heavy fire was pouring and preventing his battalion from advancing. Covered by fire from his patrol, he approached the house, killed two snipers, and tossed a grenade inside. He entered alone and a few minutes later emerged with 16 prisoners. Acting on information he furnished, American forces were able to capture an additional 41 Germans in adjacent houses. Carey then assembled another patrol, and, under covering fire, moved to within a few yards of an enemy tank and set it on fire with a bazooka round. As the crew scrambled from their burning vehicle, he picked them off with his rifle, killing three and wounding a fourth. 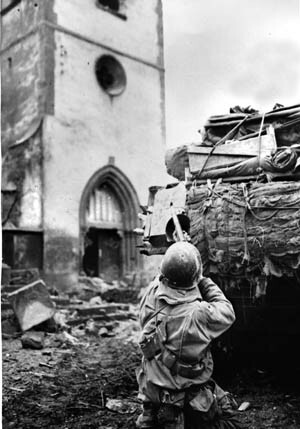 Using a tank as a shield, an American GI fires on a German sniper holed up in church in the Alsace village of Oberhoffen-sur-Moder, southeast of Haguenau, France. 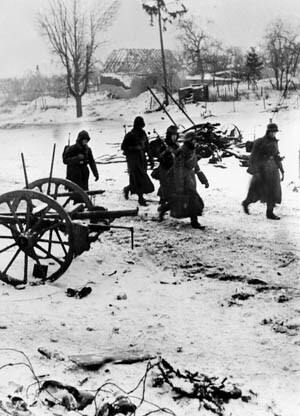 Brutal winter weather and the difficulty of urban warfare gave the initial advantage to the Germans at the start of Operation Nordwind during the first weeks of 1945. Early the next day, German infantry moved into the western part of Rimling and surrounded a house in which Carey had previously posted a squad. Four of the group escaped to the attic and, by maneuvering an old staircase against the building, Carey was able to rescue these men. Later that day, while attempting to reach an outpost, he was shot and killed by a sniper. For his extraordinary heroism, he was awarded the Medal of Honor, posthumously. Early on January 8, the zone of attack switched to the 314th’s 3rd Battalion sector, with Company L assigned the main objective: establishing a bridgehead across the Zorn River south of Drusenheim near where it met the Moder, and taking a group of buildings at the la Breymuehl waterworks complex beyond. Company K was to advance in support eastward from Rohrwiller to the Moder on Company L’s left flank. As the advance stepped off, Rohrwiller was shelled hard, causing multiple casualties in Companies K and M. Company L somehow escaped the worst of the shelling and waded the Zorn to establish the bridgehead. The rubble of buildings at la Breymuehl provided the only cover, and Company L, chilled to the bone, would hold on to its precarious position for the next 10 days. Elements of Combat Command B, 12th Armored Division, moved through Company L’s bridgehead and made it down to the northern outskirts of Herrlisheim, but the rest of the command, which was to support the drive, was held up and did not follow in time, eventually forcing a wholesale withdrawal from Herrlisheim. Companies I and K of the 314th’s 3rd Battalion regrouped, reached the Moder, and spent the rest of the day preventing the enemy from following at the river crossing. German troops, protected from the bitter cold by their long, heavy greatcoats, move into position during the fighting in the Alsace-Lorraine region, January 1945. That night, engineers worked to repair a bridge in Company L’s sector while under heavy fire. At dawn the next morning, January 9, the enemy launched an infantry attack but Company L, aided by tanks, turned back the attack, allowing the bridge to be fully repaired by 5:00 pm. At 6:40 pm, as daylight was fading, Company L was hit by another attack. This time the German infantry was strongly supported by panzers, but American tank fire, along with machine gunners from Company M, broke up the attack after a three-hour fight. The night of January 9, and into the next day, saw little activity around the 314th’s positions and the men rested as best they could, given the sub-freezing conditions. By nightfall on the 10th, however, it became evident that another enemy attack was forming opposite the 3rd Battalion’s position. For once, the Germans had more artillery at their disposal than did the 314th, and the enemy barrages were heavy and frequent on both Rohrwiller and Drusenheim. Communications took a constant hit as wiremen from both battalions and regimental headquarters were continually on the go, making repairs. Herrlisheim was in the center of the Germans’ bridgehead across the Rhine, with Gambsheim to the south and Drusenheim to the north. Facing this German stronghold, American forces very much wanted to take Herrlisheim. 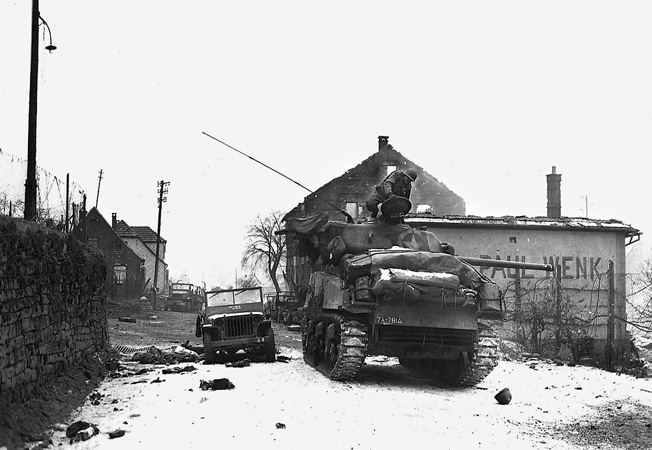 On the 10th, several supporting M-8 self-propelled howitzers tried to resume the American attack against Herrlisheim but they broke through the ice covering the network of waterways to the west of the town and were promptly hors d’combat. The puny guns and thin armor of the 714th’s Stuart tanks were also no match for the Germans, but the Stuarts did provide good service by bringing up supplies and evacuating the wounded. In one case, the spotlight of one tank was used by battalion surgeons to provide illumination for an operating table. Despite their best efforts, the American assault on Herrlisheim was called off on the night of January 10-11. Allied tank destroyers, manned by French troops, rumble through the war-ravaged streets of Bettenhoffen on their way to Gambsheim, seven miles northeast of Strasbourg. For the next several days, the situation around Rohrwiller and Drusenheim remained fairly static; 2nd and 3rd Battalions held their positions while the Germans shelled them. On January 12, Company I captured an enemy patrol of five men, which had managed to skirt the Company L position, and Company I exchanged assignments with Company K, sending I back to Rohrwiller. But the enemy was slowly increasing its presence in front of both battalions’ positions. At 3:00 am on January 13, the Company F outpost at the factory location was hit hard, and the GIs withdrew to the Bois de Drusenheim. An enemy tank, firing on the factory, also hit the church steeple in Rohrwiller with about 50 rounds. Just moments before, the steeple had been Company M’s observation post; luckily, the spotters had evacuated the OP just prior to the action. The battle around Drusenheim was devolving into a standoff. Despite so many German successes, Operation Nordwind began to lose its punch. Attempts by Rasp’s Nineteenth Army to break out of the Colmar Pocket and add its weight to the battles taking place around Strasbourg failed because the French First Army pummeled it unmercifully. Once the Nineteenth’s offensive in the Rhinau-Erstein area collapsed on January 13, General Jean de Lattre de Tassigny, commander of the First French Army, deployed the 3rd Algerian Division to Strasbourg, ensuring the survival of that key city. This, combined with the fact that just a day earlier the Soviets began their long-awaited offensive in the East, spelled doom for the Third Reich. The Germans made one final, concerted effort to break the Americans’ hold on the Alsace. On January 16, 1945, XXXIX Corps, with the 10th SS Panzer Division, 7th Parachute Division, and the 384th and 667th Assault Gun Brigades, spearheaded a drive from Lauterbourg south along the west bank of the Rhine, smashing into the 79th Division and TF Linden, and pushing down to the Gambsheim bridgehead. Like a deer on a highway, the U.S. 12th Armored Division, which had been called up from Seventh Army reserve and was at that moment engaged in an effort to take Herrlisheim, found itself directly in the path of the XXXIX Corps juggernaut—and paid the price. Infantrymen accompany a camouflaged Sherman tank on a snowy, muddy road during the Allied advance on Colmar, France, January 1945. The cold and foggy morning of January 17, 1945, opened with the 12th Armored Division’s 43rd Tank Battalion preparing to renew its previous day’s unsuccessful assault on German positions in and around the town. In that operation, a dozen of the battalion’s Shermans had been knocked out and 11 others damaged, leaving only 29 tanks operational. Lt. Col. Nicholas Novosel, the 43rd’s commander, had a bad sense about attacking Herrlisheim again. He told another officer, “Meyer, I think we’re not coming back from this one.” Novosel’s premonition would prove all too accurate for many of his men. 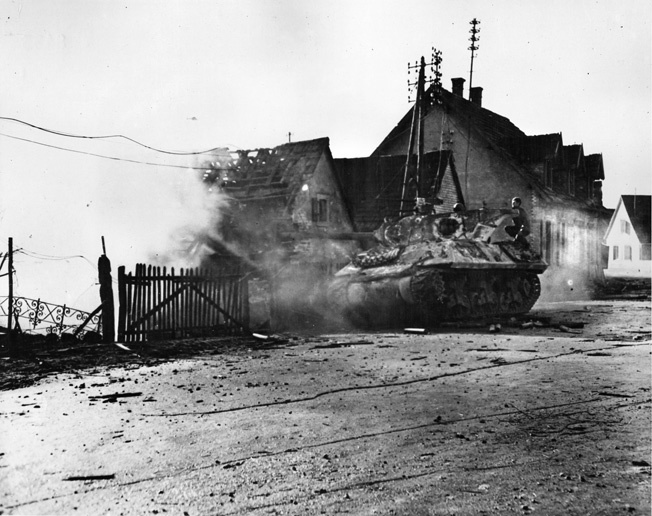 A desperate fight soon began to swirl inside and around Herrlisheim as elements of XXXIX Corps slammed into the 12th Armored Division’s ranks. 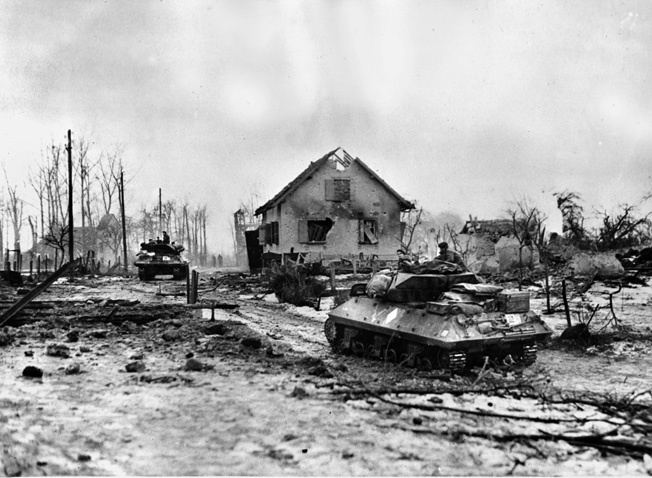 The 10th Panzer Division in the town, along with other German units in the Steinwald and the nearby town of Offendorf, caught the 43rd Tank Battalion and the 17th and 66th Armored Infantry Battalions in a deadly crossfire. Herrlisheim became a gigantic, bloody maw that devoured men and tanks. Repeated attempts by 12th Armored to drive the Germans out resulted in failure and the loss of hundreds of men and scores of pieces of armor. Although wounded 17 times during the battle, Novosel, unlike many of his troops, survived and spent the rest of the war recuperating in a German POW camp. Most of the 43rd Tank Battalion’s armor was destroyed and most of the troops either killed or captured. For two weeks the battle raged, the mountain division’s assaults, rockets, mortars, artillery, and long-range tank fire seemingly concentrated on one unit of the 45th: Lt. Col. Felix Sparks’ 3rd Battalion 157th Infantry, isolated on a hilltop. 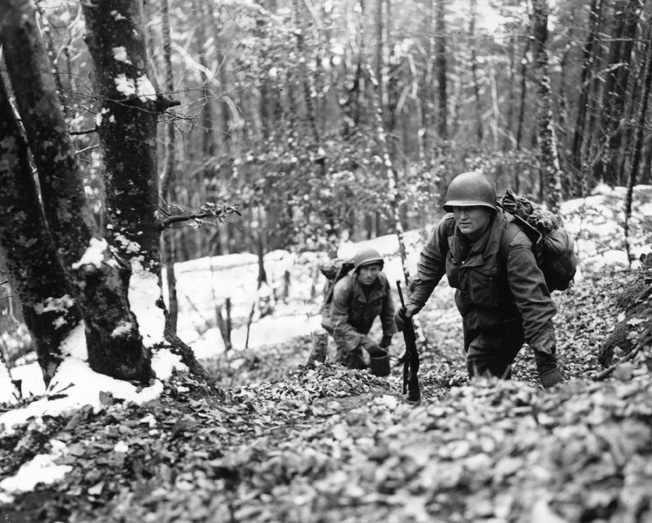 Two soldiers from the U.S. 45th Infantry Division’s 1st Battalion, 157th Infantry Regiment, lug rations and supplies through the deep snow to buddies dug in on an Alsace hillside. Resupplying frontline troops was a real challenge for both sides. 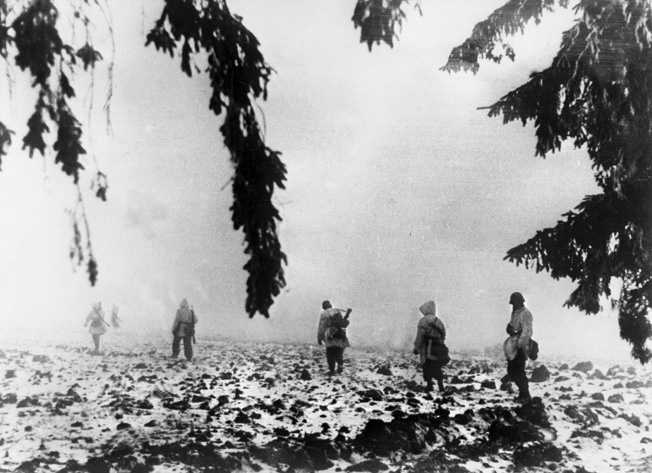 When the Germans sealed off 3rd Battalion’s resupply and evacuation routes, it appeared the men were doomed; ammunition and food were nearly exhausted, and after Company G was overrun on the morning of January 18, virtually everything was lost, including all of the heavy machine guns and an entire platoon, leaving only about 20 men in Company G still capable of fighting. Sparks, in his command post below the hill, took matters into his own hands. Ordering tank support, he hopped aboard one of only two Shermans that responded, grabbed the .50 caliber machine gun mounted on its turret, and directed the armored beast up the icy trail that led to his surrounded companies. The tank on which he was riding slid sideways on the road and was knocked out. Sparks then jumped onto the other tank that drove through the encircling enemy, leaped off, dashed across the snow, and dragged three wounded soldiers back to the tank––one at a time. The astonished Germans were apparently so awestruck by Sparks’s act of bravery that they withheld their fire while he hauled the wounded aboard the tank, which reversed back down the road to an aid station. Sparks’s valiant attempt to save his surrounded battalion ultimately failed, as did several counterattacks designed to free the trapped men. Eventually, most of 3rd Battalion was either killed, wounded, or captured. In fact, so vicious was the fighting around Reipertswiller that the 157th Regiment ended up losing 158 men killed, 426 captured, and some 600 wounded or evacuated due to illness or injury. Now it was the Germans’ turn to counterattack. On the morning of January 19, the 10th SS Panzer Division and the 21st SS Panzergrenadier Regiment assaulted American positions west of Gambsheim and Offendorf. But around noon, just as it appeared the German attacks would succeed, the overcast skies cleared and Allied aircraft arrived. The fighter-bombers strafed German positions and more than 100 tons of ordnance was dropped to break up the enemy attacks. Even then the Germans did not relent, keeping up their attacks through the afternoon. As dusk fell, 17 panzers, supported by some 400 infantrymen, attacked across the Zorn north of Herrlisheim, nearly overrunning CCB’s command post in Rohrwiller. Somehow, the cooks and clerks at the headquarters managed to hold off the assault. The 12th Armored Division was in dire straits; over the past 11 days, the division had suffered more than 1,250 casualties and lost 70 tanks, half-tracks, trucks, jeeps, and other combat vehicles. Division artillery was down to less than 50 rounds per battalion. Fortunately, VI Corps ordered the 36th Infantry Division, which had been in reserve, to take over 12th Armored’s positions, and 12th Armored went into reserve to lick its wounds. The agony was not yet over for the 79th Division, though. On January 19, the Germans’ renewed ground offensive against the 79th at both Rohrwiller and Drusenheim began. Intense German machine-gun fire created a diversion south of Drusenheim while the main attack came from the north. Assault teams penetrated the town and knocked out the machine-gun and tank-destroyer positions in Company H’s sector. Two companies of enemy infantry, along with five panzers, broke into the town, and the remaining Company H positions were quickly eliminated. 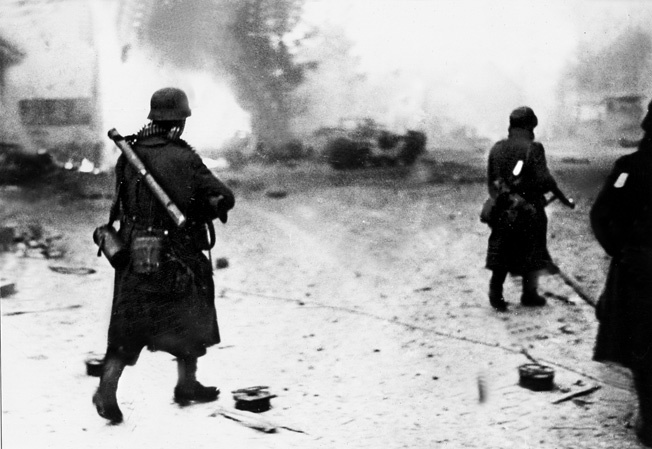 Members of a German grenadier unit pass scenes of fiery destruction during the Alsace fighting. To the south-southeast, the Germans crossed the Moder River then advanced into the Bois de Drusenheim, up the left side of Company K’s position, and forced the right flank of Company F back to the town. In Drusenheim, the enemy moved freely through the town, wiping out any points of resistance and overrunning 2nd Battalion’s command post. Much of the battalion was now leaderless, out of communication with other units, and in panic. It would take another five days before the Germans in that sector were halted and order was restored. Frank “Doc” Ryals, a medic with the 314th Regiment’s Intelligence and Recon Platoon, recalled the night of January 19 well: “The weather was terrible. There was lots of snow and I have read in our history that the temperature was 20 below. “We set up headquarters in Drusenheim, about 75-100 yards from the Second Battalion Headquarters, in a typical French house with the manure pile in the back. One squad would go out and set up an outpost between Rohrwiller and Drusenheim for 12 hours and then we would rotate. The enemy was constantly sending in sporadic harassing fire. At 1800 hours on the 19th, they unleashed heavy artillery and mortar fire on the town. This lasted for quite a long time, probably an hour, with sporadic fire after that. The attack was on. “The only big guns we had were two antitank destroyers and three wheel-mounted 57mm cannons. These were soon out of commission, either destroyed or overrun. One of the tank destroyers parked at the steps to the house we were in. Fighting was all around us. Our boys, led by Sergeant John Aven and Sergeant Ellis Johnson, were firing out the windows and doors of our house. Ellis was wounded and had to be evacuated. A dead German soldier lies on a snow-covered street in Colmar as Allied forces fight their way into the Alsatian city on February 2, 1945. 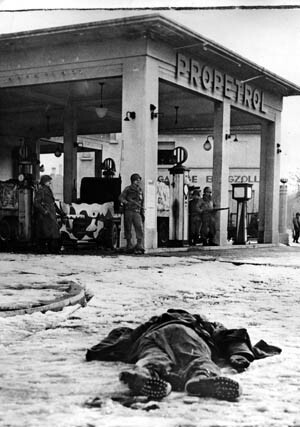 Allied infantrymen stand near antitank guns set up in a gasoline station. Staff Sergeant Howard C. Pride, the communications wireman with Headquarters Company, 2nd Battalion, 314th, was also still in Drusenheim when the Germans entered. He recalled, “Somebody from the battalion commander’s office called us and said they were giving up. I had a couple of wiremen out checking a line and they called me and they said, ‘What should we do?’ and I didn’t know at that time. I told them to come in. I should have told them to just take off and go back to regimental headquarters and they’d never have been captured. But the Germans moved around us; we didn’t get out fast enough. “They took the whole battalion that was there, which was riflemen and parts of battalion headquarters, and took us prisoner. The German tanks moved down the streets with infantrymen and they’d say, “Kommen sie aus.” They’d let a shell go every so often, and you didn’t have much chance with that. But we should never have gotten in that situation.” Pride’s entire battalion was captured at Drusenheim on January 20. Despite these setbacks, elsewhere things began to look up for the Allies. On January 21, the French First Army renewed its attacks against the Colmar Pocket and, by January 25, the German counteroffensive ran out of steam, with the Americans controlling all of Alsace-Lorraine except for a strip of the northeastern corner of France from Lauterbourg to Gambsheim. Two days later, elements of the 101st Airborne Division began arriving and relieving the 79th’s battered 314th Regiment—a sign that the Battle of the Bulge in Belgium was at last over and troops from there could be spared to shore up defenses in Alsace. In the end, the Germans, hobbled by their unwieldy command structure, had no reserves left with which to follow up on their gains, and the stubborn Americans—the cold, hungry, battered, and bandaged Americans—refused to be defeated. 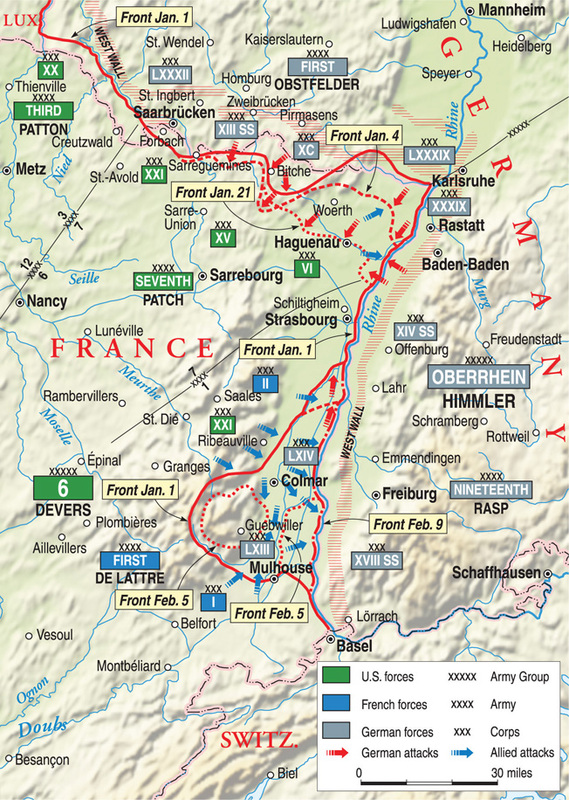 On January 29, the Allied armies in Alsace returned to the offensive. A week later, American and French units linked up in the center of the Colmar Pocket, which the Germans had abandoned. As the Germans withdrew to the east of the Rhine, Patch’s Seventh Army began a drive just over a week later to clear northeastern Alsace, and at month’s end established a foothold on German soil beyond the Saar River. Operation Nordwind did little except generate large numbers of casualties and prolong the war. For the month of January alone, Seventh Army had about 14,000 men killed, wounded, or declared missing, while the Germans lost nearly 23,000. More importantly, Germany’s losses in men and materiel could not be made up. A post-war analysis of Operations Nordwind and Wacht-am-Rhein noted, “Preservation of a united Allied command was perhaps [Eisenhower’s] greatest achievement. In the enemy camp, the differences between Hitler and his generals over the objectives of the Ardennes offensive were marked while the uncoordinated efforts of Obstfelder’s First Army and Himmler’s Army Group Oberrhein for the Alsace offensive were appalling. Tags 100th Infantry Division, 101st Airborne Division, Adolf Hitler, Allies, American Seventh Army, Axis, Battle of Herrlisheim, Battle of the Bulge, battle of the Colmar Pocket, Bernard Montgomery, Charles de Gaulle, Colmar Region, Dwight D. Eisenhower, European Theater, Flamethrower, Free French Army, General George S. Patton, German First Army, Hand Grenade, Heinrich Himmler, Jacob L. Devers, Jean de Lattre de Tassigny, Johannes Blaskowitz, Luxembourg, Maginot Line, medal of honor, Operation Avalanch, Operation Bagration, Operation Nordwind, Operation Overlord, Operation Watch on the Rhine, POW, Rainbow Division, Rhine River, Roderick R. Allen, SHAEF, Singling, Stuart tank, U.S. Third Army, wade haislip, Waffen-SS.